As you might expect from a library director’s daughter, this week’s author grew up surrounded by books. She now writes surrounded by greyhounds – Ed, Myrtle & Lillian. I’m not sure what the connection between the two is, but it works – author #33 is a bestseller of psychological suspense. Good people of the Internet, writing out of Charlotte, North Carolina – Jenifer Ruff. Night by Elie Wiesel. The horrific first-person account of survival stuck with me long after the last page. I learned something profoundly important about dignity, suffering, and the human race. It’s not about the writing, but the story being told. I don’t usually reread books, so I’d pick the longest book I haven’t yet read—Game of Thrones. I just finished binge-watching the television series. I should have read the books first. Most of George Martin’s characters are living a nightmare. They might put my marooned-on-Mars situation in perspective. Creatures of Appetite by Todd Travis. I downloaded his independently published book for free from a promo email. I love dark thrillers and mysteries with intricate plotting and I thought his was pretty near perfect. It’s hard to believe publishers aren’t begging for his next books, and I know they’re not because at the end of the book he asks for donations so he can keep writing. 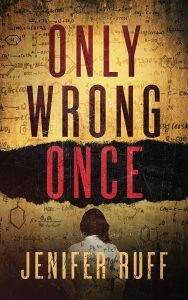 Only Wrong Once, a bio-terror suspense novel available Sept. 28th, 2017. It was inspired by my DHS agent brother. He can’t tell me anything about his job, but I know he’s privy to intelligence that would make me shudder. Only Wrong Once benefits from what I’ve learned from my previous three published novels. My hope is that I’ll never stop learning and improving the craft of writing, so my most recent book will always be my favorite, until the next one comes along. This is the hardest question! I know which books I enjoyed the most, but did they influence my character or personality? Probably not. But a terrible, bestselling, traditionally-published book did. I won’t mention the title because it doesn’t matter and it’s only my opinion, but the book got me thinking, “If he can do this, then I sure can.” Sort of reverse inspiration. And now I’m a writer, so I should thank the book’s author and publisher for providing a bit of motivational influence. Bird by Bird: Some Instructions on Writing and Life by Anne Lamott is one of my favorite books on writing. It’s clever, insightful. self-deprecating, hilarious, and inspirational all at once. Anyone might enjoy it, but no writer should miss it. Only Wrong Once. It will be discounted through most of October. I started writing it two years ago, but recent terrorist attacks and national policies have made it even more relevant, which really escalates the fear factor. All my books have a dark edge, but this one is frightening because it’s realistic. 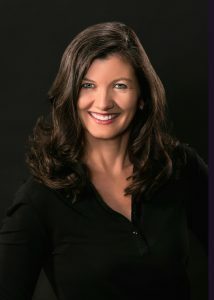 Jenifer Ruff is the author of psychological suspense books and an avid fitness enthusiast and hiker. She lives in Charlotte, NC with her family and a pack of greyhounds.